Comedy and insurance companies? Of course they go hand in hand. So, State Farm has teamed up with SNL and brought back a gaggle of classic Saturday Night Live characters to promote the company. When you have to wait on hold or fill out forms when filing an insurance claim, there’s bound to be frustration. Getting pissed doesn’t help. You have to laugh. State Farm Insurance is now providing some comedy – free of charge. The insurance company is bringing back classic characters from Saturday Night Live history in this year’s take on the Discount Double Check campaign. Of course their goal is to increase sales (and make some more money). Some of the new spots feature Rob Schneider as Richmeister, the obnoxious, nickname-obsessed pencil-pusher. Others star Kevin Nealon and Dana Carvey as Hans & Franz, the Schwarzenegger-esque bodybuilders. Even though the original SNL skits are nearly two decades old, the characters are instantly memorable. Anyone who wasn’t under a rock in the ’90s will remember these timeless characters. That’s absolutely crucial when you’re dealing with nostalgia-based advertising. And how clever is the demographic play made by State Farm? The first of the four video ads launched during the MTV Video Music Awards. The ads contain fondly remembered characters from the childhoods of young professionals. The TV campaign will be paired up with what the company refers to as a “huge digital and social branded content push.” In other words, youth, youth, youth. Millenials have buying power. DDB Chicago has done a really great job of appealing to consumers right in that sweet-spot age group for insurers – the time when people are buying their first homes, having children, etc. 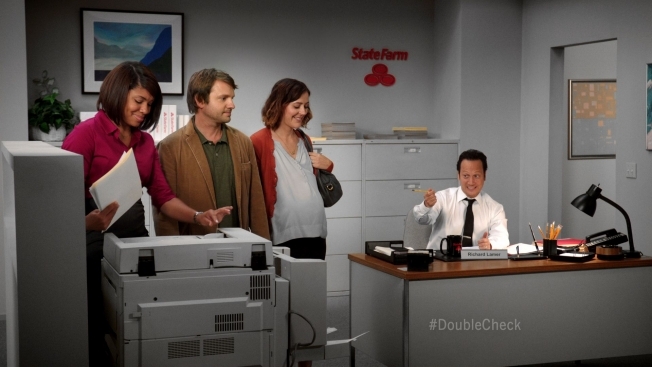 Buying insurance isn’t the most exciting part of growing up, but these spots from State Farm add a little levity. Combine the SNL-based ads with the company’s campaign with NFL great Aaron Rodgers, and you have a company that knows how to reach their target market. Insurance can be a laughing matter. Right, Lorne Michaels? Sadly, I was under a rock then. The rock of being just a tiny kid. So I don’t really remember the great humor of these spots. However, I must say that State Farm is well known to me for its hilarious ad campaigns. Awesome. I may have missed the fun the first time around, but at least I get to enjoy it now. By the way, thanks for this post Howard Davidson Arlington MA. Yes, the gags they have put up are hilarious. I don’t watch this that often but what ever I have seen, I like it. Its an interesting post by you Howard Davidson Arlington Massachusetts…Good job!